Superfood brownies that are actually healthy for you AND delicious beyond belief. Could it be TRUE?? We’re all familiar with those sugary chocolate brownies and cake grandma loves to bake, but are they really GOOD for you? Of course they aren’t! And we really shouldn’t be feeding that stuff to our kids. It’s processed food, and they should know and learn the difference. They should be taught the difference between crap and quality. Processed milk, processed sugar, processed flour, pesticides, GMOs. Why do people NEED to eat that? People who can afford it. People who think they can’t afford it. Both are missing the boat entirely. Healthycreatures know better! Those things can all be IMPROVED tastewise and ALSO come with huge health benefits to replace the health risks. Replacing health risks with health benefits, is more than just a win win, it’s a HUGE win win. Spend wisely and eat wisely and you will QUICKLY discover that you actually spend LESS on food while eating FAR higher grade meals. I usually shudder when I see that monstrous SUGAR cake that is giddily presented at just about every kids birthday party in America. It’s not just the toxic refined sugar, it’s the processed flour and it’s the pesticides and it’s the entire GMO chemical shitstorm your are consuming when you eat something THIS heavily processed in bad ways with bad things on EVERY measurable level. With pesticides and gmo’s on top for frosting! Don’t let your kids get hooked on processed / “refined” food. Instead, teach your family how to make superfood brownies that EVERYONE loves because they actually taste TEN TIMES better. These are tasty. Nobody in their right MIND would prefer the processed food version which tastes sickly sweet by comparison and is just a mirage and a pale reflection of the WHOLE food version. For kids: mix in some raw organic locally grown big fat blueberries for tasty surprises that kids love. If it’s too thick, add an egg, add half cube melted butter, but don’t make it too runny, it should be somewhat thick. FOR VEGANS: Swap in 3/4 to a full cup of Raw Organic coconut butter instead of eggs and cow butter. I’m going to try this over the holidays, might actually taste even BETTER. when it has melted, mix in your coconut sugar (or Lakanto, or maple syrup or coconut sugar, use an alkalyne sweetener, avoid acidic sweeteners).Honestly, it doesn’t matter whether you use coconut sugar, or lakanto or maple syrup. ANY of those amazing alkaline sweeteners will put a big smile on everyone’s face. Maple is most expensive, followed by Coconut sugar. If you’re really trying to stretch your dollars, get the Lakanto, you might add slightly more than half a cup to make it sweet as refined sugar. mix all the powders in a large bowl and slowly pour the sweet melted butter into the powder. but I usually just stir by hand, and if it’s too thick, add more melted butter and/or egg. You won’t want it RUNNY or SUPER DRY, you want it somewhere between runny and dry. It’s really not hard at all. My 3 year old can do it. I usually use 3 eggs, it’s perfect every time. grease up a cookie pan with coconut oil or butter, pour the batter in. bake on 350 for 15 minutes or so but keep a CLOSE eye on it because it cooks pretty fast and you don’t want to burn your superfood (this stuff aint cheap, but each package lasts a long time and produces many batches). Pour a big glass of coconut milk or raw cow milk or raw goat milk if you’re into that. You might want that sitting there to accompany your brownie in delight. Nothing but the BEST for my family! Spend a tiny bit more at the store, and spend a tiny bit more time in the kitchen, the payoff is practically infinite and people who switch from processed foods to whole foods can DEFINITELY feel and taste the difference. Not only do they taste far tastier, they are also in fact a healthy food choice! High quality raw cacao is actually great for the heart, countless studies and traditions support this fact. No serious systemic damage here, no long term systemic damage, no short term systemic damage. No coming down from a “sugar high” which is actually your system going into SHOCK essentially from the processed foods which are clearly, MOST difficult to process! Actual high quality really is a remarkable thing and worth exploring in depth. Your body has to work VERY hard to process that white sugar, and it’s basically slamming the accelerator pedal to the floor on the aging process. You will notice people who have eaten a LOT of processed foods consistently for decades, are typically obese and sometimes extra pale. There are many disturbing reasons for this I can’t cover in this article, but you will have NO trouble finding plenty of information on the DESTRUCTIVE power of processed sugar and processed foods in general. Rather than dwell on that, I prefer to present amazing alternatives, to completely turn the tables on your processed food addiction. Whole foods, really do make a huge difference. They are healthy AND they taste better, once you have experienced them a few times, it’s hard to go back to those sickly processed food ingredients. Processed foods are a nightmare most people never escape. Here’s the raw UN-processed ingredients. Nothing is bad for you below this line! Why on EARTH would you want low quality food in your kitchen? For your kids? Get the best. Thank me later! Come back to healthycreatures another day and buy some more stuff. that’s all the exotic stuff you need. I think you can find some good free range eggs, some raw organic nuts, some decent butter and some baking powder. It’s SUPER easy to make these superfood brownies and you really won’t find anything as delicious on this entire planet. If you love chocolate and you love coconut, you’re going to be in chocolate coconut heaven. Be sure and have a glass of milk handy (preferably raw). I can’t personally go COMPLETELY raw with my diet, but I try to move in that direction as much as I can and at least eat WHOLE foods as much as you possibly can. If your food items have a LONG list of ingredients starting with SUGAR or HIGH FRUCTOSE CORN SYRUP, that’s called processed food, and more and more we are finding that processed food is causing a lot of illness in people nowadays. Getting off processed foods is probably the BEST lifestyle decision you will ever make. At least cut way down and watch how much better you feel! Watch how much longer you live! 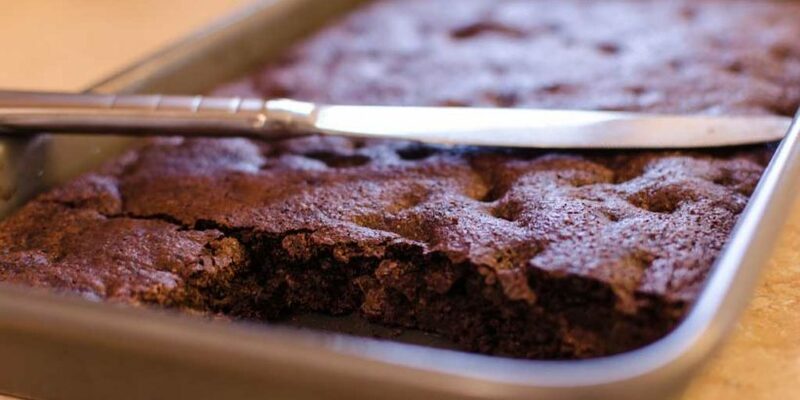 IF these brownies aren’t sweet enough for your taste, add an extra 1/4 cup of sweetener next time. IF they are TOO sweet, then pull back on the sweetener. Everyone has different preferences for their sweets and their sweetness. How much sweet is sweet enough? I find that these superfood brownies get sweeter after they cool down in the fridge, not sure why, but I love them nice and hot and I don’t really want them TOO sweet personally. Adjust the amount of sweetener until everyone is smiling from ear to ear. That’s when you know you got it just right! 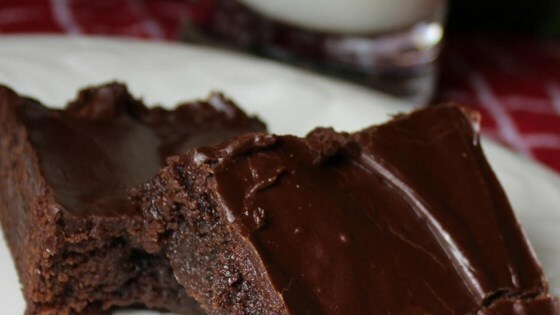 Superfood Brownies that are SUPER healthy and delicious as well. To make this into a healthy SUPERFOOD BIRTHDAY CAKE for kids. Simply make 3 or 4 or 5 batches in a ROUND pan. Make them one by one, unless you have 3 or 4 or 5 round pans, then go nuts bake em all up at once! Then just smear something really really amazing/healthy/sticky between each layer. You could make your own jam with locally grown organic berries mushed up and you might not even need to add any sweetener there, but you could experiment with the 3 different healthy sweeteners listed. Or you could layer between the cakes with many other things…I’ll be adding some links for cool healthy stuff to use for frosting, I have some really fun creative ideas for that which I will share soon here. 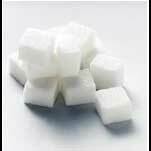 If you have vegetarians in the group, avoid marshmellow which contains meat by products in most cases. Also avoid gummy bears and gummy worms which are also NOT vegetarian in most cases.